The JPFO-IWO folkeshul, the most popular network of Yiddish dayschools in the area which was run by Jewish labor socialists. The Los Angeles neighborhoods of Boyle Heights and City Terrace have always been working-class communities, and the home of many progressive and leftist causes. This is a tradition which was well established early on by the politically and socially active Jewish community which flourished here in the first half of the 20th century. So many ideas on how to fix society bubbled out of this community! Everyone, young and old, promoting social advancement. However, with so many visions being proposed and tried there were bound to be some contentions along the way. Yet, many of the communal schisms were caused by cautious fears of persecution as much as internal conflict over a social vision. In 1922 political tensions in the Arberter Ring/Workmen’s Circle created a rift, out of which grew the leftist branch of the organization which would become known as the International Worker’s Order (IWO). However, the rift was so great that the IWO made an official break-away in 1930; promoting leftist, progressive values and operating as a fraternal mutual aid organization and insurance provider. The organization also organized 13 other major ethnic communities and languages – including Italian, Spanish, Ukrainian, Greek, Portuguese, etc. 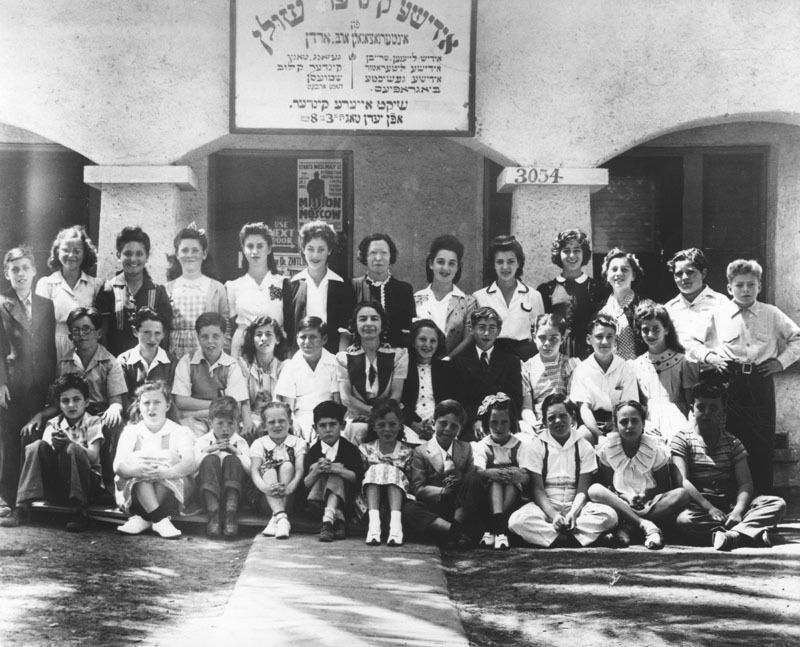 However, in the first half of the 20th century the Los Angeles Jewish Section was the largest and most important Jewish organization there was. The group started a couple folkshule sites – two Jewish community centers in two notable locations. They ran two Jewish kindergarten day-schools off Wabash, enrolling most of the kids from the area; one of them being the yellow house sitting at the corner of Wabash and Stone. The front of the former Kindereshul, at Wabash and Stone, City Terrace, Los Angeles. Then they founded the Jewish Cultural Center in City Terrace, which was eventually demolished to make way for the off-ramp to the 10-freeway. This Jewish cultural center once sat directly at the spot of the current freeway ramp, just immediately east of today’s City Terrace Spanish Congregation. 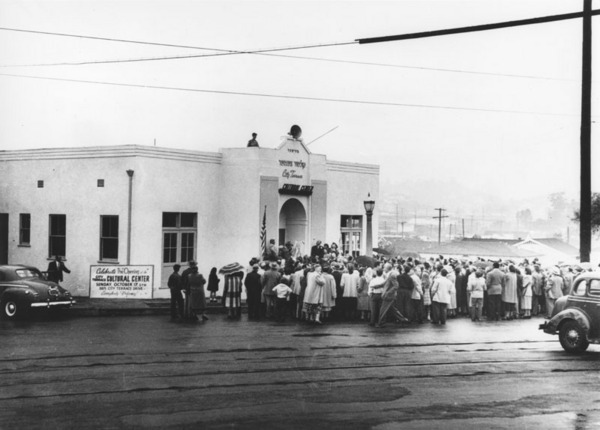 The City Terrace Jewish Cultural Center, on Grand Opening Day 1947. It was eventually closed during the Red Scare. The site of the old JCC now sits directly in the exit for the 10-freeway exit at City Terrace Drive. What you see today as you exit from City Terrace Drive. However, it must be stated that the loss of these resources for the community was not just on account of displacement. The political tensions and the fear of the community being targeted as socialists during the Red Scare, these also played heavily into the gutting of the resources of the largely progressive Jewish community here. 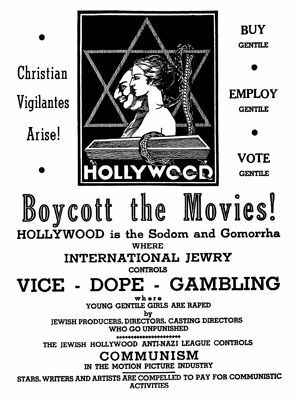 “After the Second World War, the rise of McCarthyism with its intense focus on Hollywood leftism together with the virulently antisemitic campaign of California State Senator Jack Tenney, made IWO a clear target. It also became the prime scapegoat for anti-communists and anti-progressives and for members of the L.A. Jewish community establishment, which sought to publicly distance themselves from leftism. 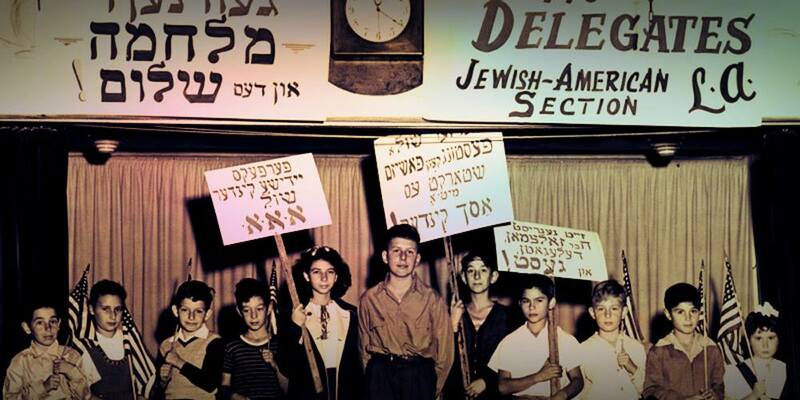 Children of the International Workers order Jewish-American Section in Los Angeles, holding Yiddish protest signs. Even the children of the neighborhood were encouraged to be involved in labor and political activity from an early age. “While the IWO-Jewish Section was one of the most popular Jewish organizations in the city and had more children enrolled in its school network than any other single Jewish organization, a campaign began in 1949 to expel it from the official Jewish Community. Members of the Jewish Community Council claimed that community support should not go to any “international” organization. Although the IWO-Jewish Section had become the Jewish People’s Fraternal Order (JPFO-IWO) in 1944, this was not enough. L.A. Jewish Community Council members challenged the JPFO as political movement and argued that its leftism was a violation of of the Community’s apolitical stance. When the JPFO argued that Zionist organizations were also overtly political, opponents claimed that its domestic politics were the problem and that support for the fledgling State of Israel was not to be considered a “political” cause. Partly to distinguish their particular liberal-left bent from the more radical JPFO, the Workmen’s Circle along with the American Jewish Congress argued vociferously for the JPFO’s expulsion. “The L.A. developments followed the pattern of the nationwide McCarthyite witchhunt. IWO was placed on the U.S. Attorney General’s list of “subversive” organizations (Dec. 5, 1947) and the New York State Insurance Department of moved on December 14, 1950 to liquidate the Order on grounds that its significant cash reserves — far beyond what commercial insurers were required to maintain — would, in the event of war with the Soviet Union, be turned over to the enemy. The City Terrace Jewish Cultural Center, on Grand Opening Day 1947. It was eventually closed during the anti-communist Red Scare. 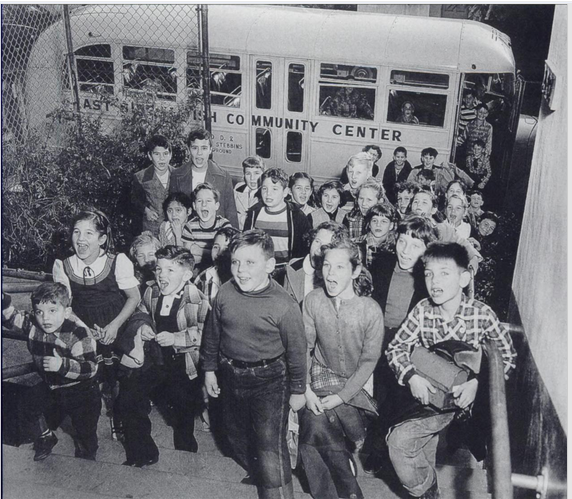 It might seem to some that the eastside Jewish community centers were inevitably doomed because of demographic changes, with Jewish people migrating away in great numbers, especially among the rapidly emerging youth demographic. However, it is important to note that at the same time many other radical leftists and labor socialists were also moving here to be part of a movement; the eastside becoming one of the last-stand leftist enclaves. And it was that form of “threat” that drove the Jewish Community Relations Council (the forerunner to the Jewish Federation of Greater Los Angeles) to be both be complicit to McCarthyism and to also snuff out the eastside community centers. Undoubtedly, this closing of these cultural sites which the remaining Yiddishists and Jewish social progressives of the area depended on further accelerated their exodus from the eastside. All any historian can say at this point is that we would hope that if such political witch-hunting were to happen today that our community leaders would not make the same decisions. That we would instead have the integrity and courage to stand in resistance to such ultra-nationalism. I’d like to believe we have all learned our lesson, in light of this dark chapter of history. We will explore this more when we further talk about the impact of the Senator Jack Tenny led witch-hunt against communists in Boyle Heights. Now I should note that while the building of the City Terrace JCC was eventually demolished to make way for the freeway off-ramp, most of the other sites remain in one form or another; re-purposed as churches, houses, stores and youth centers. In the near future I hope to talk more about the other Jewish and Yiddishist sites of City Terrace. There really is so much to explore. And yet there is so much that has been forgotten too. Do you or your family members have stories to share about the Yiddish community of City Terrace? I’d love to document them as well. How can we revolve conflict and prevent violence in our changing eastside communities? What can we learn from history regarding this? What should the community keep in mind as we see the demographics changing here once again? What should we consider as we see an uneasy integration taking place here? 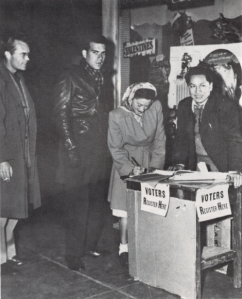 Voter registration, during the historic 1948 voter drive in which 15,000 new voters from the barrios were registered by the efforts of the Community Service Organization (CSO). This is what really provided the democratic muscle to help Edward Roybal, our first Mexican-American local representative, get elected to the LA City Council. 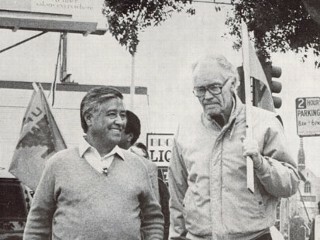 The CSO received its essential funding and mentoring in organizing from Saul Alinsky, and his Industrial Areas Foundation, under the guidance of his local representative Fred Ross Sr. (see photo,far left). As well as financial support directly from the local Jewish Community Relations Committee (CRC), today known as the Jewish Federation of Greater Los Angeles. The reality is that this type of turbulent change, it has happened all before. Community change being met with racial conflicts and classist fears, this has all come around before. However, it’s important to remember that the people of this community have a profound history of forging inter-community partnerships to conquer prejudice and racial tension. This was especially true in the late-1940s through the mid-1950s, in the partnerships between the shrinking Jewish community of the area and the growing Mexican American community of Boyle Heights, East Los Angeles. During the years leading up to and then through World War II many Jewish people and minorities had a lot in common still, because the nature of prejudice and the persistence of segregation in that age. In those days their partnerships were essential and seemed quite natural. Though I believe that history clearly shows us that the partnerships between Jews and Latinos becomes most interesting in the post-war years. Though sadly, most people write off the history of the Jewish eastside after the war. During a time when such partnerships could be considered counterintuitive to many. The reality is that telling the story of inter-community relations becomes much more complicated after the war, so many just avoid it at all cost. As Jews and Latinos begin to have less in common with each other, which does result in increased friction. Frictions which were not uncommon before the war, and the specter of which fearfully hung over the Jewish community with even greater concern following the war. In the decade following the wartime riots, the general population was genuinely afraid of a resurgence of riots. And the larger population even fearful of Mexican residents taking vengeance on them, expecting an eminent explosion of Mexican rage in the form of riots. So what did the Jewish leaders of the area do post-war to fight racial conflict and prevent violence in the changing community? How did they overcome the issues of having to deal with the communal bitterness felt by the growing racial minority groups regarding housing and job market inequity? How did Jews react with even being perceived as exploiters and absentee landlords controlling these older neighborhoods? The fact is scape-goating of Jews in the eastside has existed as far back as any of us remember. And it is something that the Jewish community out of necessity realized they had to address more assertively when they found themselves in the role of being the smaller minority here after the war. We need to more honestly tell the story of the communal challenges of that era. Instead of avoiding the hard truths which culminate at this point in history. We need to recognize the reality that even in the “good old days” of the historic interracial community of Boyle Heights of yesteryear which many are prone to idealize today, even then the established community of Jews of the area had to put a great deal of work and invest a lot of money into dispelling racism, classism, antisemitism and preventing misdirected violence. The reality is that inter-cultural and inter-faith respect of classic Boyle Heights was not just a given. Living next to people of other races and cultures, it did not necessarily integrate people to one another, nor effortlessly create mixing and understanding. Again, it took real effort and true intention to accomplish this sense of community cohesion with a diverse population of residents here. Which begs me to ask: So why is it that today people expect it to just happen all by itself? Why is the current establishment of our community federations really doing nothing to support direct inter-community cooperation and inter-racial socialization? How is that today they do not see fit to really contribute anything to mitigate a long history of tensions which are revisiting us here? I dare say that my fellow community, cultural, religious and interfaith leaders of today really need to learn some pages from our local history. And reflect on how to help our community of today resolve the currently rising tensions, in tried and true ways. 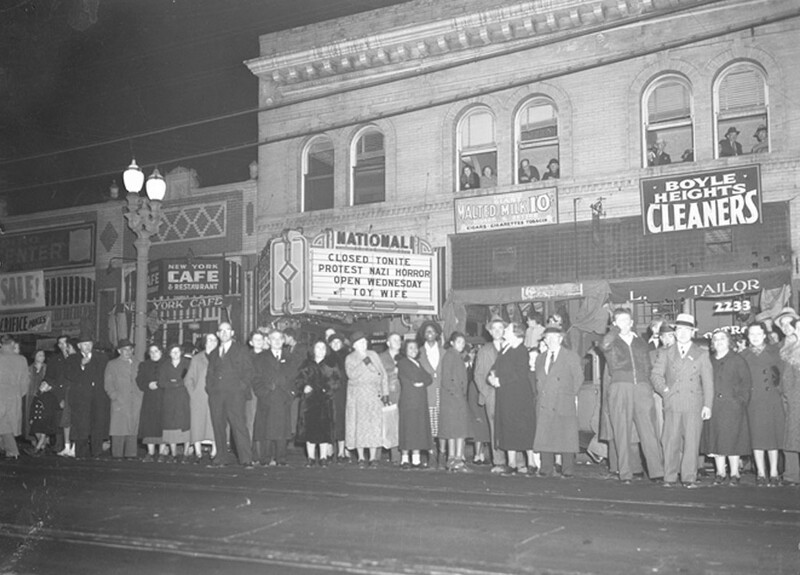 The Zoot Suit Riots’ legacy factored prominently into postwar calculations about the value of cooperating across community divides, especially as the mounting housing crunch and employment discrimination escalated racial tensions in minority areas. As tensions threatened Angelenos’ safety, they stirred Jews’ and Mexicans’ — along with the rest of Los Angeles’ fears that violence would once again erupt in their city. The American Council on Race Relations’ 1945 study titled The Problem of Violence: Observations on Race Conﬂict in Los Angeles: explained: “There was general apprehension on the part of many who had seen the evidences of friction increasing and apparently cumulating, who had lived through the ‘zoot-suit’ riots.” These people, the study reported, “feared that post-war Los Angeles with its restricted employment opportunities for Negroes and Mexicans, its wretchedly inadequate housing facilities and its greatly increased population would become a battle ground on which Americans battled each other.” The threat of violence forced Angelenos to realize that wartime attempts to improve race relations in the city had fallen short. Sometimes the tensions and competition for resources did result in violence, both between whites and minorities and among minority groups. Much of the violence was perpetrated against minorities, especially African and Mexican Americans, by whites…. East Los Angeles Jewish and Mexican community, among whom relations were particularly strained as the two groups’ financial, social, and geographic distance increased, viewed potential violence as an especially salient issue. 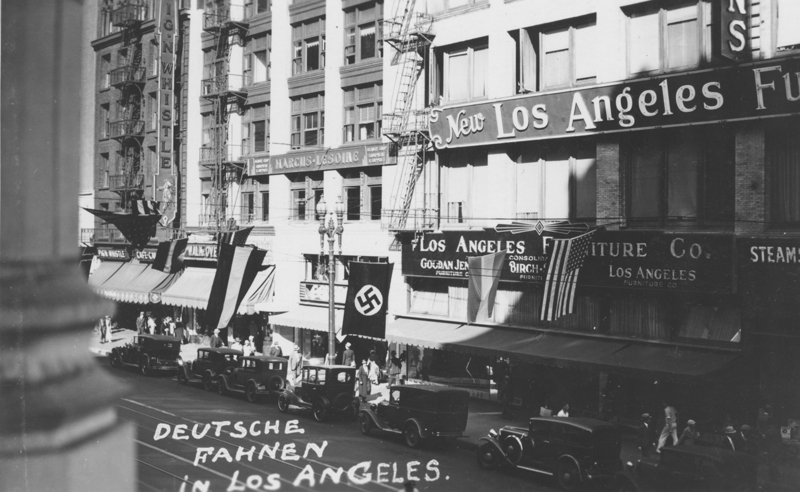 As Jews in Los Angeles, as elsewhere, confronted housing restrictions and employment discrimination, they, unlike Mexican Americans, also made economic strides, became increasingly integrated, and gradually moved toward the more affluent west side. The Mexican origin population, on the other hand, was “Southern California’s largest and, in many ways, most disadvantaged minority,” according to a 1949 report by Alinsky’s Industrial Areas Foundation. The group’s poverty, lack of networks to other communities, low voter turnout, and high percentage of non-citizens, according, to reports like these, impeded attempts at securing financial backing to pressure politicians to improve their conditions. A 1946 investigation of racial minorities’ conditions by the ACRR concluded that the Mexican-American community was in even more dire straits other than poor Los Angeles minorities. Mexican-Americans saw their Jewish neighbors moving to nicer neighborhoods while their own conditions stagnated or deteriorated, breeding “frustration and bitterness.” Alinsky’s Industrial Area’s Foundation reported, “These, in tern, found expression in intergroup hostility and scape-goating with particular reference on the Eastside to the adjacent Jewish community.” Jews who moved west frequently kept east side businesses and retail properties, which sometimes provoked charges of exploitation from their former neighbors. Associating Jews with exploitation stemmed in some cases from anti-Semitic assumptions, since many non-Jews also became absentee landlords. 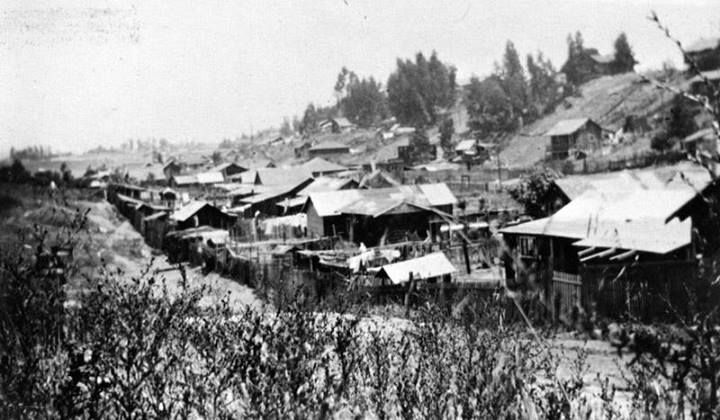 A colony on Fickett St. showing a number of bungalows built in a canyon in Boyle Heights. 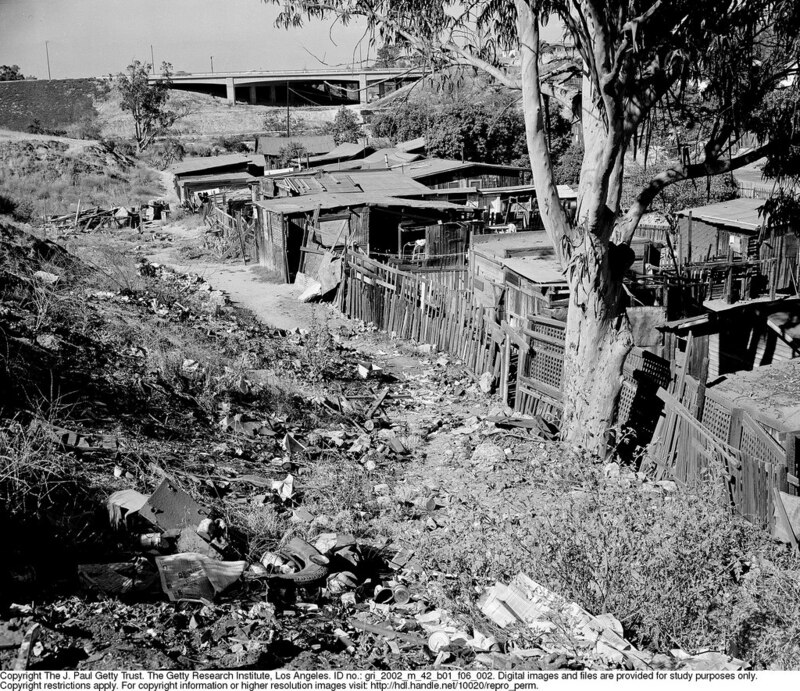 This was one of the poorest barrios, which impoverished Mexicans were relegated to; out of sight and concern to even people of good conscience. In short, memories of World War II-era violence and fears of its recurrence helped inspire postwar collaboration. 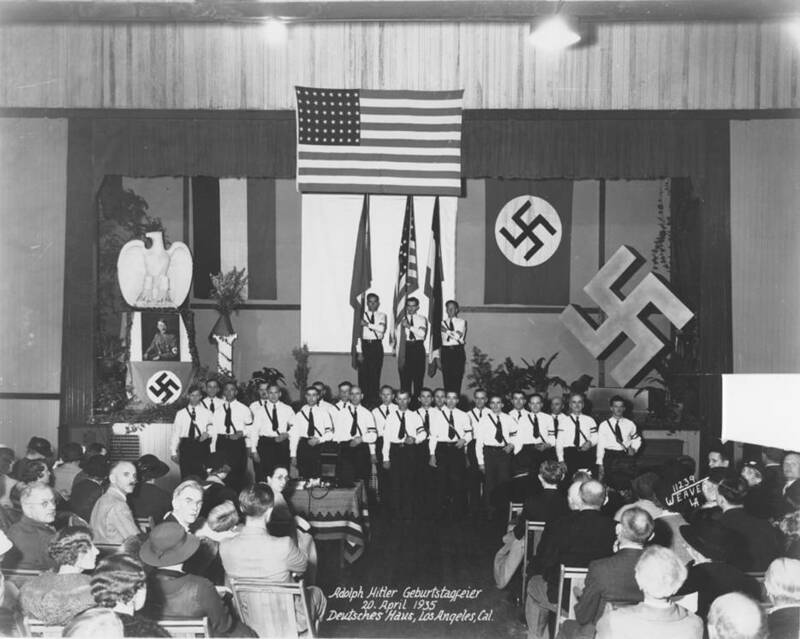 In cases like the CSO, such fears even resulted in important new postwar civil rights initiatives which continued the earlier thrust of reform and demonstrate the continuity between 1935 and World War II era collaboration and its later Cold War incarnation. In a previous post I actually went into great detail about the CSO, when talking about the connection between the early garment worker’s movement of the 1930s-1940s, and the rise of the CSO in 1940s-1950s, and the continuity of these social justice aims which eventually gave rise to the United Farm Workers in the 1950s-1960s. 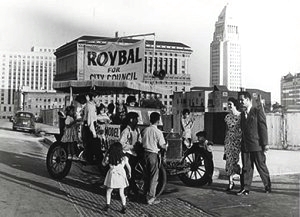 Royball would ride a wave of crucial Yiddish speaking political support in Boyle Heights, backing his ascent to City Hall and further still. The future Congressman Edward Royball would later take his social causes to the halls of the US Congress with him as well. Community Service Organization (CSO) meeting in 1955. Photo: http://www.fredrosssr.com. The contributions in civil rights organizing which began here in Boyle Heights with inter-racial cooperation in establishing the CSO, it would bear fruit even beyond this community. 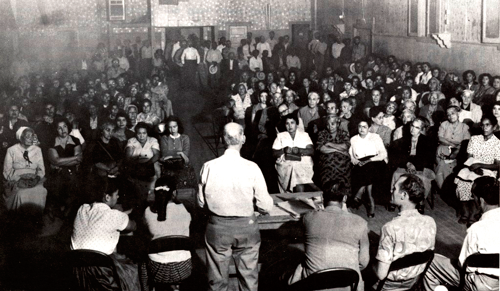 Inspiring the pursuit of even larger gains of empowerment of working-class Mexican-Americans. Though it was a multi-ethnic endeavor. And their achievements of this era, they were attributed to their inter-community cooperation. While Bernstein and I tend to often focus on the labor and political organizing history of this area, it is very important to note the more well known cultural and social activities which contributed to better race relations and for strengthening community cohesion. The eastside Jewish Community Centers most notably provided programming for all of the community; it was open to Jewish and non-Jewish people alike. Indeed as much as 15% of the members of the Soto-Michigan Jewish Community Center were not Jewish, as well as about 3% membership of the more Orthodox Zionist-based Menorah Center in City Terrace. While these centers offered programming for the members of the local Jewish community, they also sought to meet the needs of all their neighbors as well. Though these numbers might seem modest, this did make a major impact in forging the community’s sense of interracial fellowship; offering after-school programs, sports and swimming. In an atmosphere free from the racial segregation which was common in most other neighborhoods and at many public facilities. 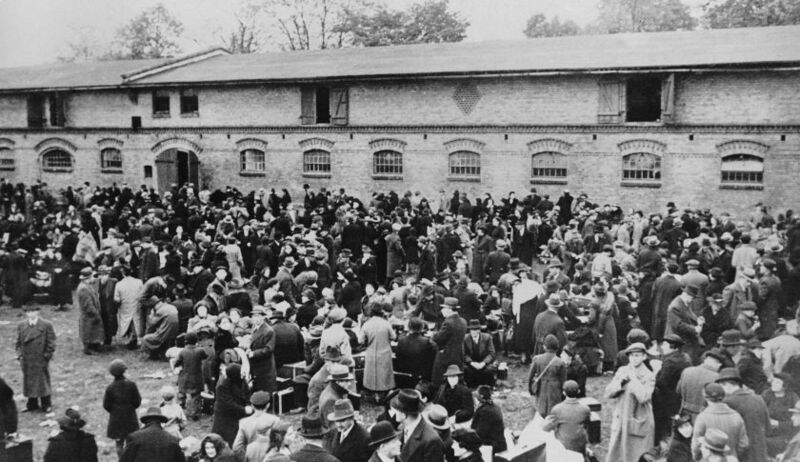 After the war, and after the steep decline of the Jewish population of the area in the decade to follow, these Jewish community centers began to refocus their efforts to further bring the causes of the current non-Jewish residents into their walls. And also giving space to socially progressive causes of the area’s working-class immigrants. As we will further explore, this progressive stance eventually came with major consequence and persecution for the remaining Jewish community leaders here on the eastside. During the McCarthy era Red Scare which was feverishly consumed with the weeding out of communists. In a political atmosphere where promoting socialism, internationalism and labor progressivism made many people targets for being labeled communists enemies of the state. Inevitably, it was their open door policy to people of all backgrounds and political persuasions which would in the end doom these Jewish community centers later on in the 1950s.